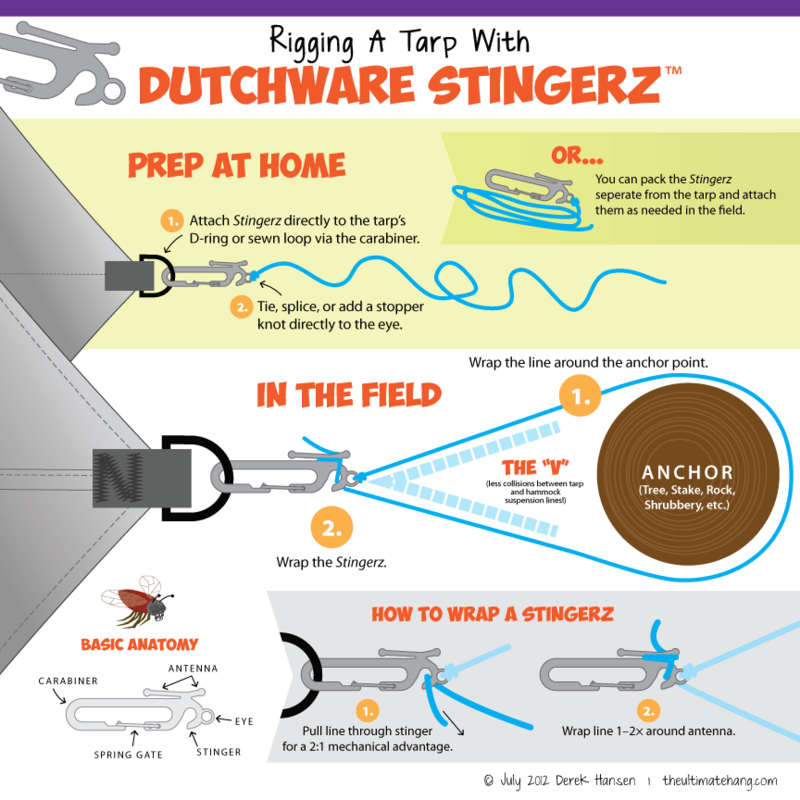 One of my favorite hardware options for rigging a hammock tarp is the DutchWare Stingerz™. These titanium clips weight a scant 0.25 oz. (7 g.) for the pair and are easy to use on any tarp. I drew this diagram to show how I use Stingerz in the field. I splice or tie one end of my line (again, braided mason line), take the line around the tree and back to the Stingerz to create the “V” for the hammock suspension. The Stingerz also feature the “stinger” where you can catch the line and pull back for a 2:1 mechanical advantage to get the tarp line taut. Finish by wrapping the line once or twice around the “antenna.” I find that once around the antenna is sufficient to hold the line. I store my Stingerz with the line separate from my tarp as I tend to switch tarps depending on the trip and I can easily clip on the Stingerz to any tarp thanks to the mini carabiner end.